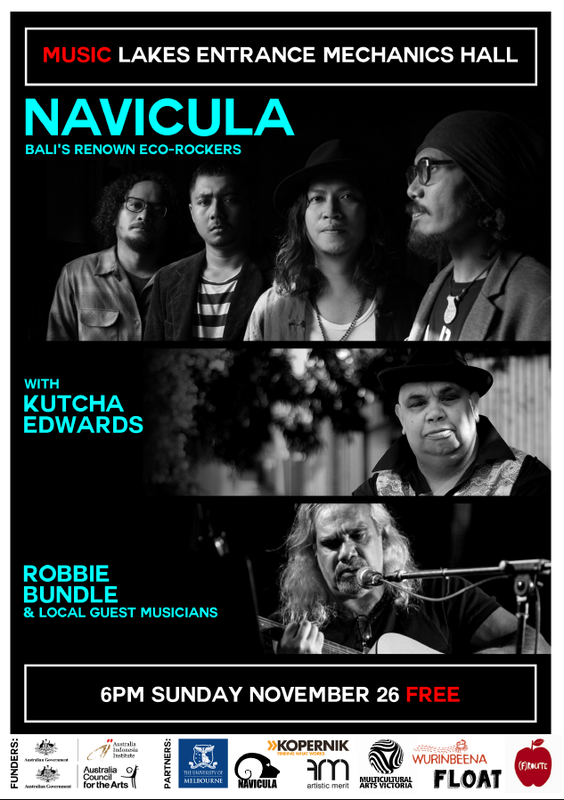 Navicula, headed by lead singer Gede Robi, is at the intersection of a wild psychedelic grunge experience with alternative and progressive music from Bali. They’ve toured Canada, US, India, Italy, Thailand, Cambodia, Vietnam and Myanmar and advocate for environmental and social change wherever they go. The band’s seventh album ‘Love Bomb’ was recorded at the legendary Record Plant in Hollywood and the eighth album, ‘Tatap Muka’, is a live acoustic record currently released on DVD. Navicula has released 8 studio albums and frequently collaborates with social and environmental organisations such as Greenpeace Indonesia. Tonight they are joined by extraordinary songmen Kutcha Edwards (Mutti-Mutti) and Robbie Bundle (Bidjura /Yuin). Kutcha Edwards is power and transformation in sound, embodied in human form. After spending 26 years in the music industry, Kutcha Edwards has performed with some of the biggest names in Australian music, from Renee Geyer to Jimmy Barnes and many luminaries in between. However, while holding his own as an artist, he’s at a stage in his life where he’s focused on the bigger picture. Edwards is dedicated to engaging with indigenous youth as much as he possibly can. His phenomenal work ethic stems from a need to continue the history and stories of his forefathers. Robbie Bundle grew up in East Gippsland and is a singer-songwriter and musician who has been writing and performing music for more than 35 years. He has performed with artists such as David Gulpilil, Dave Arden, Bart Willoughby, Archie Roach and many others. Also a filmmaker, MC and a musical historian of the Songlines, Robbie’s latest album, Universal Ark, is out now. This week local artists and young local musicians have been collaborating together under the leadership of Kutcha and Robbie and joined by Navicula and tonight you get to hear thei work. The artists will be joined throughout the evening by guest local musicians associated with Wurinbeena. This gig will be great for the whole family. Tonights gig is made possible by a collaboration between Artistic Merit and the incredible local East Gippsland organisationsations Wurinbeena and F.INC [(F)ROUTE and FLOAT] with the University of Melbourne, Kopernik and Navicula with support of the Federal Government through the Australia Council and the Australia Indonesia Institute of the Department of Foreign Affairs and Trade.